1. Pizza delivery! The fat-free variety of course.....loving these new goodies! 5. If I could have my childhood back - this is the bed I would want....how totally OTT! Hoping to scrap on the weekend....how about you? Happy List for Lin (for this weekend). 1. Being married for 17 years! Can't think of any others cos I've got a bug and am not particularly happy! D'OH! Oh wow I love that art work!!! Im of too gooogle her. PS LOVING big Love! !b but what is Gourmet farmer?!? my mummas coming over for a visit from france soon! 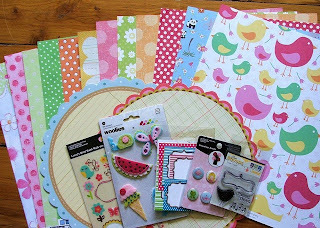 LOve those scrapping goodies! What brand? 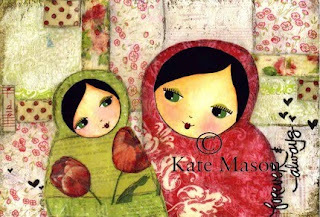 Lucky you getting the Kate Mason artwork, I love her stuff, so fresh and original. I want one too! Gourmet Farmer sounds like fun..what channel and what day is it on? 1. Going to the AC/DC concert on the weekend, a real blast! 2. Enjoying the company of the family in Sydney. 4. Getting home and finding that Granny is OK after a spell in hospital. 5. Cooler weather, meaning a better night's sleep! 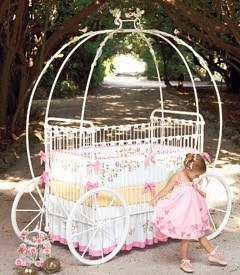 Sorry you didn't get the OTT Princess Coach bed when you were a little girl! I am getting guilty Mummy feelings now.............were you deprived?